BC Fishing Seasons: The Fraser Valley is an optimal location for fishing all year long. Just like the seasons, the many different species of anadromous and freshwater fish that can be found in the surrounding lakes adhere to their own biological and internal stream. All five species of salmon: Chinook, Sockeye, Coho, Pink, and Chum, as well as Steelhead, Trout, and Sturgeon can be found in surrounding bodies of water such as the Lillooet, Harrison, Fraser, Vedder, and Upper Pitt River. If you love salmon, starting in the spring, Chinook run from April to October. Sockeye salmon run from July to October, peaking in mid-August. Coho and Pinks follow the Sockeye run beginning in mid to late August. The Pinks are the shortest run and they end in October, whereas Coho can be caught until November. BC fishing seasons for Chum kick off the fall run in September and last until December. Winter Steelheads take over the rivers and are very popular on the Vedder River from December to April. You can only fly fish for steelhead during the Month of May. After the salmon have spawned, the trout come to feed on the salmon minnows from January to June. And the lock-nest monster’s second cousin once removed, known as the prehistoric sturgeons, can be reeled in between February and December on the Fraser. 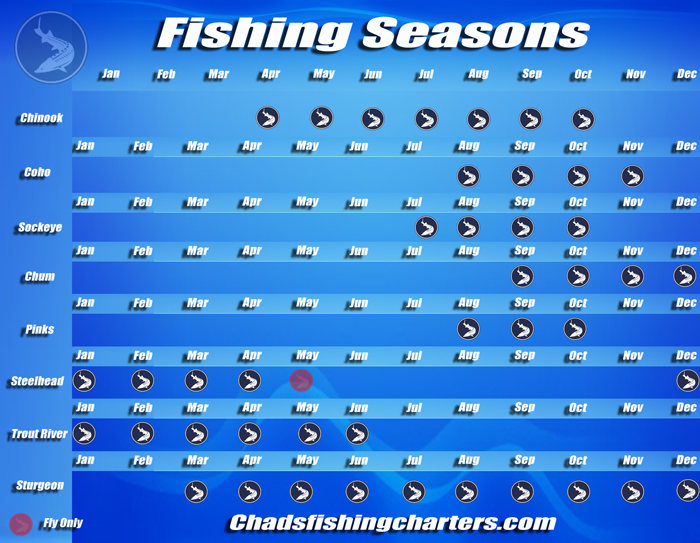 Chad’s Fishing Charters offers guided fishing trips all year long. Depending on the time of year and what you are hoping to catch, Chad and his professional guides know where the best spots in the Fraser Valley are to guarantee you get what you came for and more! Handcrafted by Chris Powered by a Internet StuntMan. Get in Touch.